The cat’s OK but can it save my story structure and give me a great logline? 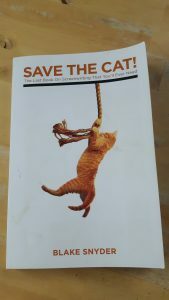 If you struggle with story structure, theme, or bookending your work with definite character progression, then Blake Snyder’s screenwriting guide, Save the Cat! is a must-read. I started this book last week and I’ve re-read parts of it so many times already, in particular his guidance on creating a killer story premise or logline. I’ve done Snyder’s writing exercises, and read out loud to friends the industry-insider anecdotes that Snyder scatters throughout his book. This book addresses my primary story writing weaknesses: the logline (I’ve never had one) and story beats (I have them but they judder like a bad-news cardiogram). Since reading this book, I’ve been working on both, and found the writing growing stronger every time. Snyder refuses to let you start your brilliant story until you can say, in a simple sentence or logline, what your story is. The logline forces you to examine the premise of your idea, and tests if it is strong enough to carry a whole story. His conviction that there must be something ironic about the logline, something that draws in the audience with its promise of trouble or fun, echoes CS Lakin’s advice that every good story must have a ‘concept with a kicker‘. I found working on loglines incredibly helpful. Having to produce a logline strengthens every idea. Maybe you have this idea about a guy who wins a million pounds. OK, but what’s the irony – the kicker? How about if the guy is the worst possible person to win because… he’s got a week to live… he daren’t let his family get their hands on it…the love of his life hates wealth … he just became a monk … he’s just been put in jail -? A rich guy who got lucky isn’t enough of a story. The worst possible rich guy, a rich guy with an ironic reason why he can’t enjoy his new wealth…that could be the start of something. Snyder uses the example of the movie Four Christmases to illustrate his insistence that your logline – and your title – must answer the audience’s question: what is it? In this case – it’s a couple who must endure four separate Christmases with their double set of divorced parents. The irony? The couple are ready to commit to marriage and want out of their parents’ disastrous relationship history. Snyder’s other piece of pure gold in this book (among lots, lots more that is high value) is his beat sheet: fifteen points through which every successful story must pass. He demonstrate how every smash-hit movie fits this structure, whether it be Miss Congeniality or Elf. The three-act structure will be familiar if you’ve looked at work by James Scott Bell or KM Weiland – but has just 15 points, including the opening and closing images which define for your audience how the hero has changed. For these 15 points, Snyder suggests a maximum of 40 scenes. He’s dealing with movies, but that’s a good number to go for in a novel too – you may end up with more, but 40 is nicely achievable. And only 15 points to hit, including start and end – that feels eminently doable! This book is encouraging throughout and avoids the hectoring tone employed by some other story structure books. The examples are memorable and entertaining – the Pope in the Pool! – and their lessons are easy to learn. I know I will be watching for the hero’s ‘save the cat’ moment in the next film I see, and in every story. because if the hero doesn’t show humanity, even a tiny bit of it, then for Snyder, he ain’t the hero. I recommend this book without reservation. The only downside is that now, as well as writing novels, I want to write a movie. Blake Snyder’s Beat Sheet has been adapted by various writing blogs, including this one on Jami Gold’s website. You could also set up this structure in Scrivener, which would be great for shuffling around your scene ideas. 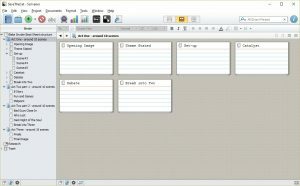 Scrivener’s corkboard view is great for shuffling around scenes within your story structure. Irony – it must give an involving and dramatic situation. Compelling mental picture – a whole movie, including its timeframe, must be implied. Audience and cost – for novels, the target audience and tone. Killer title – says what the story is, in a clever way.